Our immune system is essentially our own personal inner-military. A weak military can’t defend itself or attack its enemies very well, rendering it a doomed excuse for protection. 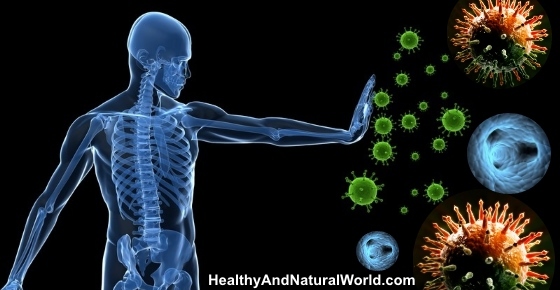 When your immune system is weak, your body is left vulnerable to viruses, allergies, and all the other enemies lurking all around you. There are plenty of grueling ways you can slowly change your lifestyle to work on this – or you could try these 10 quick life hacks to improve your immunity almost immediately. A sleep deprivation can have surprisingly devastating results on the production of antibodies (your body’s infantry). It turns out that a good majority of people in a tech-saturated culture are cutting sleep breaks too short. Organize your schedule and get into a routine that fits between seven to nine hours per day. If a hectic schedule doesn’t permit this, try finding time within the day for a few power naps. To get a better sleep, you can try these herbs, foods or natural substance. Do sleep and diet sound obvious? Because these are essential aspects of living, but many people overlook importance for convenience. The abundance of sugars packed into sugary soft-drinks and processed sweets has a dulling effect on the way your immune system cells function. If you haven’t already, get your body used to vegetables and fruits of all shapes and colors. They provide vitamins that are essential to a smooth running immune system. A regular exercise routine does much more than shape your body, it fortifies the immune system with proper blood circulation and better sleep. It shouldn’t take long for your immunity to make clear improvements. While you’re exercising, remember to keep yourself hydrated before, during and after exercising. This will help flush out toxins and transport the minerals and vitamins from a healthy diet. Also remain wary of the germ loaded bars, grips and machines in public gyms. Think of the things that make you vulnerable to germs and disease and do your best to avoid them. Harvard Health publication mentions that stress of any kind can have negative effects on your immune levels. Both social and physical stress that you experience delays the production of antibodies. The sad thing is that stress can be, and often is, an unavoidable factor in many people’s lives. The best you can do for your body is find ways to alleviate the stress, like with meditation, yoga, exercise, and new hobbies. It’s no coincidence that many people that live great past their prime are level headed. It suppresses your immune system weaker and slows the defense of antibodies when you are exposed to outer threats. The clouds of carcinogens billowing down the esophagus rips up soft tissues, leaving you more vulnerable to an infection. It may be a difficult addiction to quit, but many former smokers will attest that they feel healthier than ever. Smoking is also one of the habits to stop right now if you want to be healthy as mentioned in my previous article about the 10 habits to stop right now if you want to be healthy. Social anxiety can lead some people to isolating themselves at every given chance from the world around them. Though the exact causes for it haven’t been pinpointed, there are several studies that can back the effectiveness of a healthy social life on the immune system. Get out and form friendships with new people, step out of isolation, and watch your immunity remain strong. There are studies that mention the positive effect of the sense of humor on the immune system. Both positive attitude and maintaining social relationship with family and friends are featured in my e-book 70 Powerful Habits For A Great Health which will guide you how to take positive steps to improve your wellness and overall health. Studies show that without a healthy dose of vitamin D3, the body is much more vulnerable to autoimmunity and infections. People fail to realize their vitamin intake and fall sick despite an otherwise healthy diet. You can find more information on how to increase your vitamin D levels in my previous article about the common diseases caused by vitamin D deficiency. When somebody consumes an excessive amount of alcohol they often don’t consider the damage they are putting their body through. In large amounts it restricts the dispatch of immune defenses and leaves the body susceptible to harm. If you’re old enough to drink you shouldn’t completely avoid it in fear of your health: according to the British Journal of Nutrition, a moderate amount of alcohol can actually benefit the immune system. Many people associate bacteria with a potential to degrade health. Probiotics are a healthy type of bacteria that help the digestive system, immune repair, and immune defense. They keep the bad bacteria from proliferating and ensure a healthier lifestyle. According to medical studies, foods like yogurt, miso, apple cider vinegar and kefir have good probiotics that can boost your health. But you can also purchase a high dose probiotic supplement that will give your body an ample dose of good bacteria. You can find more benefits of taking probiotics in my previous article about why probiotics are so good for you. Building your internal army isn’t very difficult. Once you’ve picked up on the right habits, your body will settle into a groove that is difficult to lose. Consider these immunity hacks for a happier and healthier life. the “key-lock” of antibodies to antigens and the efficiency of the removal of the harmful bacteria from the body. I post my immunity natural by taking onguard essential oil daily. It contains wild orange, clove bud, cinnamomn bark, eucalyptua radiata and rosemary. It is known for its antibacterial, antifungal and antiviral properties. It also is beneficial for abscess (oral), aie pollution,bladder infections, candida, chronic fatigue, cleansing, cold sores, colds, Coughs, flu, gum disease, haltitosis, hypoglycemia, infections, lupus, mold, mono, MRSA, plague, pneumonia, scabies, sore throat, staph warts, and warts. Other essential oils are good for the immune system too. Such as oregano, melaleuca, rosemary, clove, frankincense, geranium, lemon, thyme, lavender and lime. You can dilute any of these oils as needed, and apply 1-2 drops to bottom of the feet, along spine, or under arma( around lymphnodes). Add 1-2 drops to 1 Tbs. Fractionated coconut oil, and massage onto back, arm, and feet. Place 1-2 drops under the tongue or place in an empty veggie cap and swallow. I sometimes vomit for no reason, I can be right one minute than start vomiting. Is there a reason for this..thank you for answer, regards Kerry.. There can be numerous reasons for vomiting (for example see here) so if this continues for no apparent reason, I would check it with a doctor.